Diane Comer was left unfulfilled by trying to follow the rules and be a good girl. When she begged God to give her more, he did, but first took her through a trial that almost ruined her faith - deafness. Diane shares how she found the solid rock of real faith in the midst of brokenness. 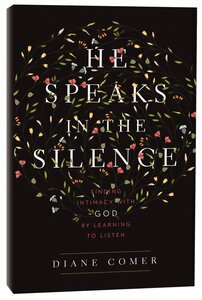 About "He Speaks in the Silence"
He Speaks in the Silence is the story of Diane Comer's search for the kind of intimacy with God every woman longs for. It is a story of trying to be a good girl, of following the rules, of longing for a satisfaction that eludes us. Like so many Christians, Diane thought she'd signed up for the "wonderful plan for your life" and deafness certainly didn't fit her idea of a wonderful life. Yet in her brokenness, God met her and lifted her out of the pit of despair she was digging for herself. He lifted her onto the solid rock of real faith, and taught her to believe He is good even when life goes bad. Using vivid parallels between her deafness and every woman's struggle to hear God, this book reveals how Diane learned to listen to God, finding intimacy with her Savior and the soul deep satisfaction she longs for. Diane Comer is the Director of Early Childhood Education at Becker Junior College in Worcester, Massachusetts. She holds a BS degree from Cambridge College. She had many years of experience as both a teacher and a teacher educator in the field of early childhood education. Customer Reviews For "He Speaks in the Silence"
I first got to know about this book after reading a devotional by the author. It's a great book with honest and heartfelt thoughts penned by the author. The book is easy to read and it's very inspiring. Throughout the book, the author answers questions that the reader probably has in mind too, e.g. why won't God heal her if He obviously can? I love reading every page of the book and I'll highly recommend it.